Over 400,000 people have improved their test performance using AssessmentDay. Join them to beat the competition. I used mostly numerical and logical tests, and they showed to be very helpful. I passed all the real tests. It was especially useful for the PwC assessment. Excellent explanations in the answers plus tips for avoiding common errors. As revision exercises I found these most helpful and would certainly recommend them. I did the Logic tests, practice really does improve your results as you train how to approach the questions. These tests accurately predict your reasoning potential. I really enjoyed using this platform. I actually found just practicing quite fun. There are so many tests to practice and at such a good price! Amazing value for money. Brilliant! AssessmentDay tests were actually more difficult than my actual assessment so I passed easily. Very helpful! Large bank of questions regularly updated with worked solutions. Instant online access means you can practise tests anytime anywhere. Practice reduces anxiety and improves your ability to perform well. Prepare for your online aptitude test with worked solutions. Find out who has the reasoning skills to work for your company. With practice vs. without practice. 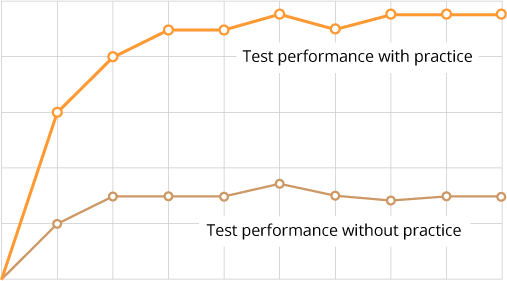 Results of people’s performance before and after practice show improvements of up to +25%. The scientific literature shows that ‘practice effects’ exist. It is reasoned that the reason practice effects exist is because candidates expend less mental energy dealing with the newness of the situation and have more free mental energy to allocate to answering the question. Try some of our most popular practice tests. Test your ability to work with numerical data. Practice tests with solutions, tips and advice. Test your ability to reason with verbal information. Make assumptions and make logical inferences. numerical tests, verbal tests, logic tests, reasoning tests, and much more. All questions come with fully worked solutions.